A hair oil serum with double-caring of Jeju camellia oil and fermented camellia oil that helps damaged hair and keeps it healthy. 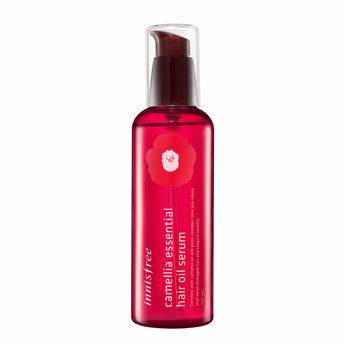 Camellia essential hair oil serum that creates silky hair. Fermented camellia oil fills the holes of damaged hair and camellia oil coats the cuticles. This hair serum revitalizes damaged hair affected by frequent perm and dyeing treatments. This serum is instantly absorbed into the hair, nourishing the hair for a range of hairstyles. Additional information: Innisfree, the first natural brand from Korea, is dedicated to share the clean and pure energy of nature for healthy beauty. It shares the benefits of nature from the pristine island of Jeju, allowing for vibrant beauty and pursues an eco-friendly green life to preserve the balance of nature. Widely popular worldwide, this brand is creating spaces where nature and skin can rest in the green energy of pure Jeju. Try Camellia essential hair oil serum now! Explore the entire range of Hair Serum available on Nykaa. Shop more Innisfree products here.You can browse through the complete world of Innisfree Hair Serum .